We’re leaving “oh-dark-early” in the morning to go to Kansas City, so the day was spent doing laundry, cleaning out the fridge, and–oh yes–dropping hundreds upon hundreds of dollars fixing that problem with my car from way back in the summer as well as the brakes. Yeah, you probably thought I’d gotten that fixed already, right? As I was signing my name to the credit card, the friendly man was telling me about how they’d also cleaned the car and they were at that very moment driving it to the door for my convenience, and I told him that for this much money I would also like a chocolate cupcake, please. No luck. Anyway, once the girls were home, they were enlisted in packing themselves. This is what we do for every trip, and they really enjoy it. They’re always chomping at the bit to get started, and I’m telling them that they have to wait until I’ve finished another load of laundry. 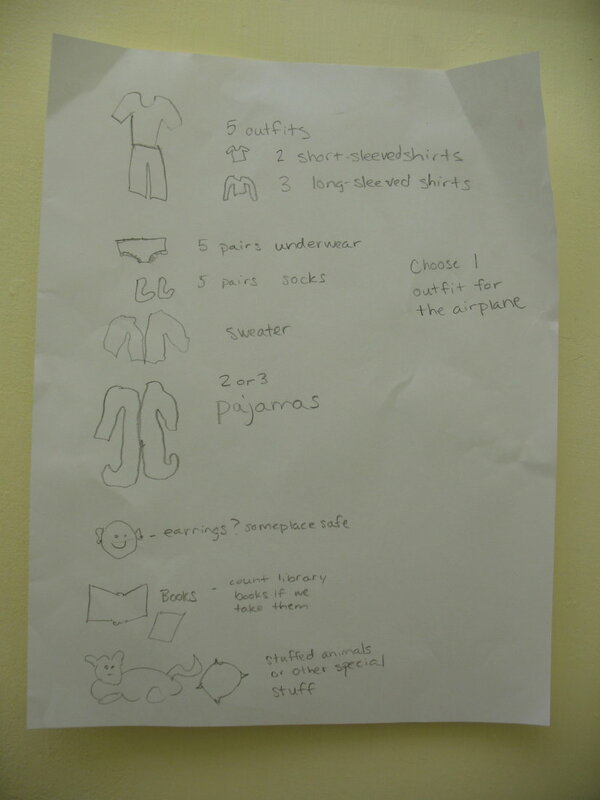 I make a list of items that they need (here I put 5 outfits, 5 pairs of socks, a sweater, etc. 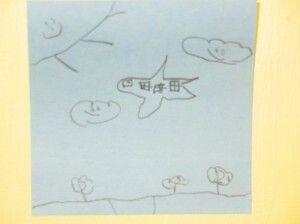 ), and then I also draw little pictures because J doesn’t read yet. Then they take it upstairs and I stay out of their way until they declare that they’re done and I make a final inspection. It not only saves me time, but it keeps them occupied and surprisingly cooperative as M helps J with the list and they offer each other fashion advice. 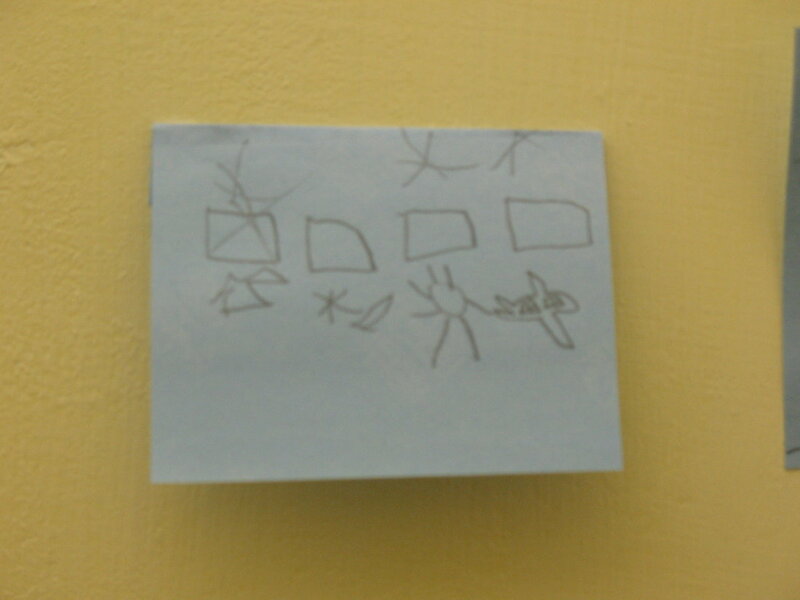 This photo’s bad, but I had to take it after I realized that, for this trip, J was making a little pictogram checklist, too. 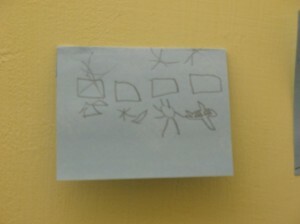 So, I found this little Post-It next to the back door. She’s doing her own personal countdown for the trip. 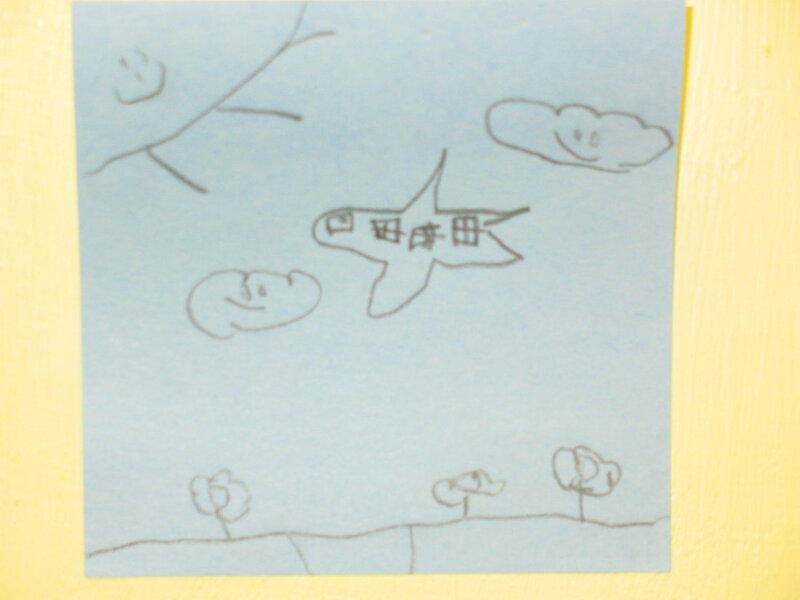 The far left is an unfathomable symbol that represents dinner, then there’s a star and moon to represent night, the sunshine means once we’re in the airport (this because she’s always sleepy and thinks it’s too bright while we’re waiting to check in), and the final step is the airplane. Once we’ve completed all the steps, we’ll be on our way! And even the sunshine and clouds will be smiling on us! I’m cutting it short for the evening, but please, if you think of it, send settled-stomach vibes to poor Miss M tomorrow morning. I know: we travel quite a bit for people who aren’t terribly good at it. But we like our families and none of them live nearby. I keep pointing out houses for sale on my street, and everyone just smiles and ignores me. Don’t they know how fun it is here?!? I WILL be thinking of M, she is such a trooper. Love your packing idea…definitely should be in a magazine! (I say that to you a lot)…anyway, Happy thanksgiving…and BRING ON CHRISTMAS!!!! 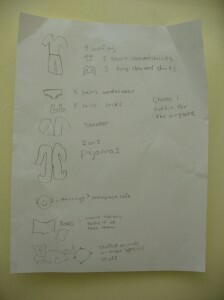 Love the packing list…totally stealing it! Have a safe trip and we’ll miss you! Have a wonderful Thanksgiving with all W’s family. We’ll miss seeing you, but look forward to Christmas! love ya….